The first posting with my new camera. A camera without all the lenses, but a zoom to 600 mm. The Gadwall (Anas strepera) is a common and widespread duck of the family Anatidae. The Gadwall was first described by Linnaeus in 1758 in his Systema naturae, under its current scientific name. DNA studies have shown that it is a sister species with the falcated duck, and that these two are closely related to the wigeons. • A. s. strepera, described by Linnaeus, is the nominate subspecies. • A. s. couesi, Coues' Gadwall, extinct circa 1874, was formerly found on Teraina, a coral atoll in the Pacific Ocean. The etymology of the word gadwall is not known, but the name has been in use since 1666. 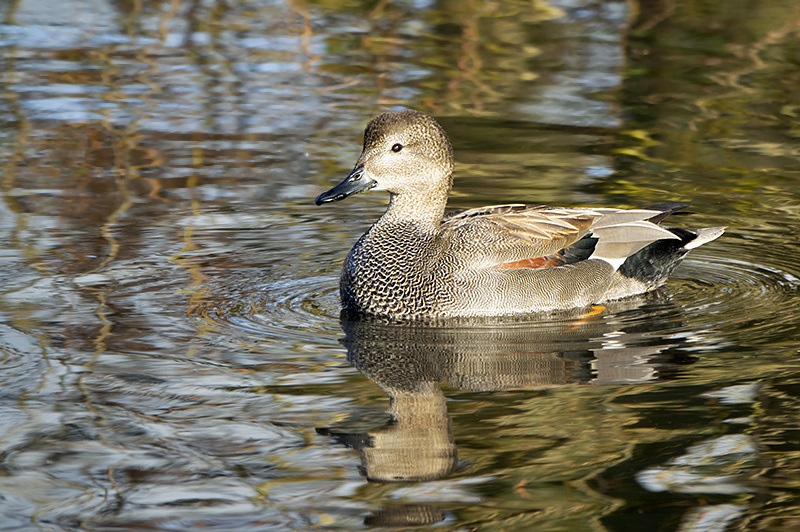 The Gadwall breeds in the northern areas of Europe and Asia, and central North America. The range of this bird appears to be expanding into eastern North America. This dabbling duck is strongly migratory, and winters farther south than its breeding range, from coastal Alaska, south into Central America, and east into Idaho, Kansas, Ohio, Virginia, and then south all the way into Central America. Its conservation status is Least Concern. Nice to see you again, welcome back! I love the Sony ultacompact cameras, this one seems superb also. Perfect exposure and awesome details, nice moirée effect on the plumage, under the neck. Beautiful composition, exposure and sharpness, and the ringlets around the duck is pretty neat. Very elegant, congratulations! Hi, the perfect choice for wild life photos, me study much about and my hard luck this was not available here. The one inch sensor has it's own charm, hope to see more beautiful posts in future. Well exposed and composed nice framed. Amazing point-and-shoot Sony camera with a zoom of 600mm, Peter! That's a very convenient piece of equipment and the picture taken with it is just marvellous technically as well as aesthetically. Wonderful framing and immaculate details. Nice image with excellent details and colors.